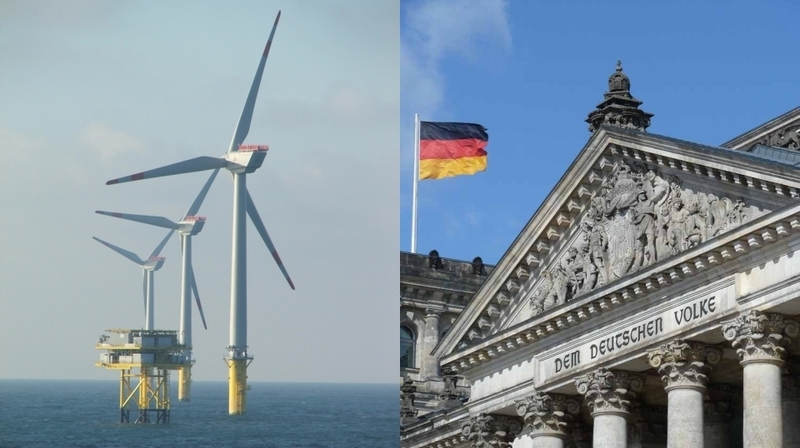 Germany is 20 years away from 100 percent renewable power – not! In 2015, Germany added more renewable electricity than ever before in a single year, bringing the share of green power in total supply up to 33 percent. But the government seems keen on slowing down this growth. What is really happening? Craig Morris investigates. Last year, Germany generated 32 TWh of additional green electricity – the largest single hike in history. In comparison, it took Germany from 1991 to 2004 to add roughly that amount. The previous annual record increase was 20 TWh in 2012. Total German power production came in at 647 TWh, a record 50 TWh of which was for export (net) – an increase of around 50 percent above the previous record from 2014. Around eight percent of German electricity was thus generated for export, a level that now rivals France. 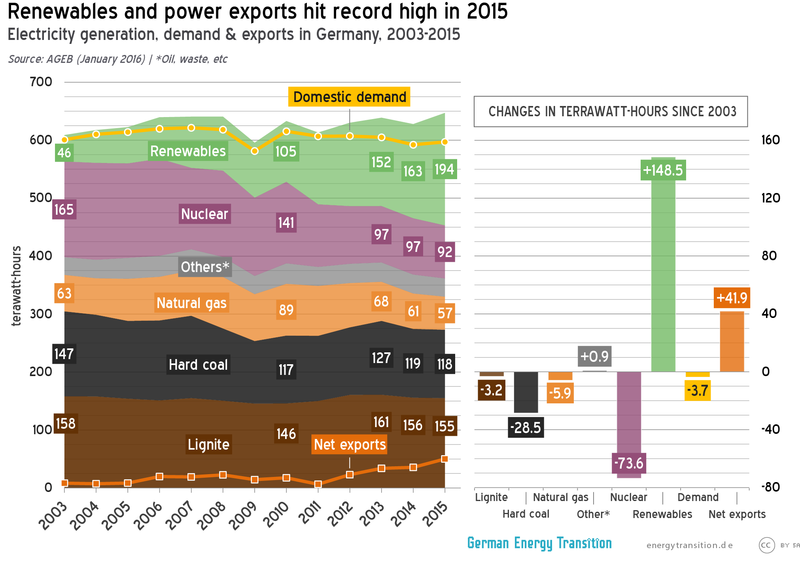 Remove those exports, and domestic German power demand comes in at 597 TWh, roughly in line with previous years. Renewable electricity made up 30 percent of all power generated and 33 percent of domestic power demand. As the chart below shows, the share of nuclear fell year-over-year, largely because the next reactor was shut down as a part of the phase-out. Amazingly, natural gas continues to get squeezed out of the power sector; experts already believe it is close to its minimum level (partly for cogeneration) and cannot go down much further. Finally, hard coal and lignite dropped ever so slightly by just under one percent each. Much of the increase in renewable power generation was wind power, which grew by nearly 29 TWh. Onshore wind is currently booming as developers rush to complete projects before auctions are rolled out in 2017. Likewise, 2015 was a bumper year for the offshore wind sector, where power generation grew from a mere 1.4 TWh to 8.1 TWh. A lot of wind turbines were also added in 2015, so we can expect tremendous additional wind power generation in 2016 as well. As the chart below shows, the share of renewables in power supply grew by 3.1 percentage points annually in the six years from 2010-2015. With only 66 percent of conventional electricity remaining, the country would only need another two decades to reach 100 percent renewable power – theoretically. In practice, however, a number of related problems would need to be solved, especially power storage and grid lines. One reason why Rainer Baake, member of the Green Party, was appointed Industry Undersecretary to handle the Energiewende was his history of focusing on the grid, which he called “the bottleneck for the Energiewende” back in 2012 (in German). In addition, Germany would need to scrap its entire conventional fleet, and no one has a solution for those financial challenges. For this reason, the government adopted a limit – the country’s first ever – on the growth of renewable electricity in 2014. 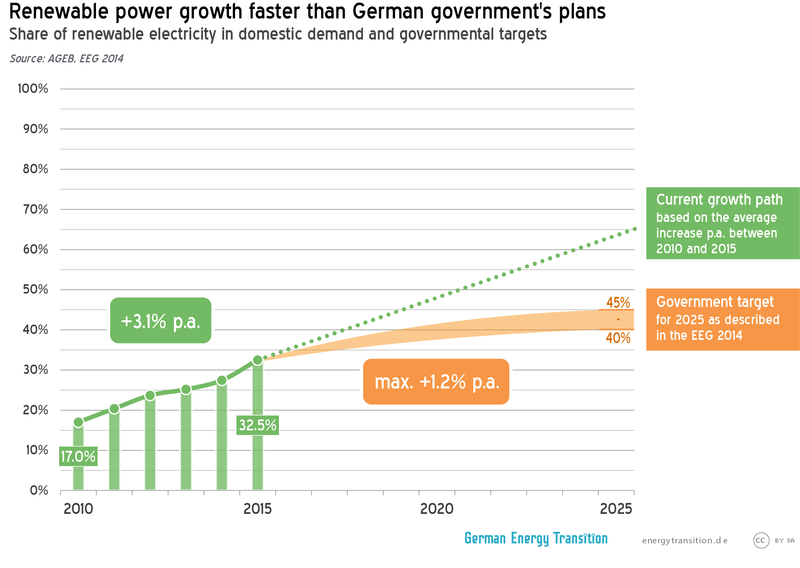 By 2025, Germany is to have no more than 45 percent renewable power. As the chart above shows, growth is to be cut almost by two thirds over the next decade. After all, the official target is 80 percent renewable electricity by 2050, not 100 percent by 2035 (the current theoretical course). Here, we see the necessity for the transition from feed-in tariffs (FITs) to auctions. FITs allow any project worth doing to go forward, whereas governmental (or utility) experts determine the maximum growth rate in auctions. On December 8, the government published a new paper showing what that new growth would look like. Biogas additions are to be kept below the replacement rate, meaning that the share of this electricity will eventually shrink. Small PV arrays will continue to be built outside of the auction system, so the government will adjust the volume of auctions for wind power and large PV to fill the gap – except that there is also a target for offshore wind of 6.5 gigawatts, which could be increased to 7.7 GW by 2017. Last year, offshore alone grew by 6.7 TWh, equivalent to around 1.1 percent of German power demand. At that rate, offshore wind alone might take up practically the entire growth space left. As I pointed out in this blog last summer, the onshore wind market, where community projects have flourished, could be told it can no longer build because the offshore sector has priority. 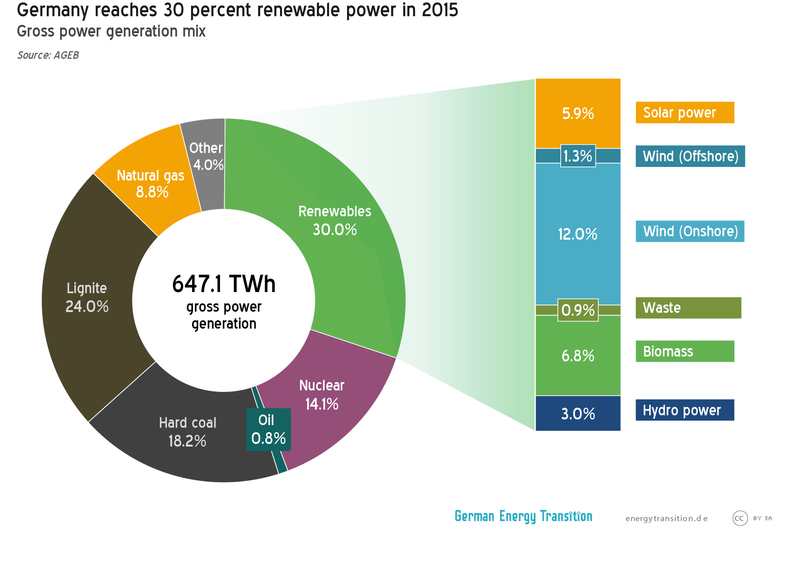 So while lots of people celebrate 33 percent renewable electricity in Germany, we have our work cut out for us in 2016. The government is about to hand over nearly all of the remaining growth to the large utilities that invest in offshore wind. In the process, the people who drove the transition over the past 25 years would be shut out. Craig Morris (@PPchef) is the lead author of German Energy Transition. He directs Petite Planète and writes every workday for Renewables International. Craig Morris (@PPchef) is co-author of Energy Democracy, the first history of Germany’s Energiewende. Things can work out much faster. Off-Shore only jumped because so many projects that were built in previous years were connected in 2015 when grid was finally available. In general off-shore remains too expensive. And it is not close to any of its consumers and thus requires massive additional infrastructure investments on land. Indeed, if we are to reach government targets, the growth of renewables has to be massively reduced (so far renewables always out-performed any ambitious targets). In the face of Paris-comittments to reduce CO2 this slow down is counter-productive – and must be avoided. If auctions are so cool, perhaps we should start with auctions for off-shore? The growth of solar has definitely not been help by auctions – and neither have solar auctions produced significantly lower prices. As far as I know none of the countries using auctions out-performed their targets for renewables – or have I missed something? As far as I know FIT-systems have been extremely efficient in combining low cost with high adoption rates of renewables (with a minimum of bureaucracy). I do not see any “necessity for the transition from feed-in tariffs (FITs) to auctions” at all for the foreseeable future, unless you want to protect the inefficient energy dinos from dying out (something they will do anyway, no matter what) – instead of protecting our climate. The problem with both the FiT as the auction model is that they do not include a plan on how to transition to a market based system, i.e. where the RE plant owner sells directly to the electricity market. Sweden could only 5 years away from a nearly 100% RE power grid. Vattenfall – the majority owner of the existing atom power fleet- has anounced that they have to close all of them. Not just the 4 previously announced but ALL. And this would mean a nearly 100% RE power grid. Interesting that in articlethe company states that the atom tax isn’t the culprit alone causing the atom bankruptcy. But the remuneration of the REs via the so-called certificate system. Which needs to be scrapped as well to keep the atom power plants operable. € 4 billion need to be invested in the Swedish atom power industry to comply with the ‘teachings from Fukushima’ – to install a second independent cooling lsystem into the existing plants. Since the job needs to be done until 2020 the money must be made available and the investment decision being made now in 2016. But the investment would ruin the atom business. This could be forced onto the German (European) power sector as well: comply with the environment and climate targets within a set time. The REs have now a market impact that does not allow for further investments in the European atom and fossile power market. How do electric cars fit? Surely a switch to electric cars would enable further growth in local and community renewables? For December 2014 lignite, hard coal and methane power production sums up to 23.30 TWh, for December 2015 only 22.27 TWh. That is – 4% in CO2 power. In total there was more power produced in December 2015 compared to December 2014 in Germany, the 2.7% growth in power production is owned entirely to the REs. Since less power was consumed in Germany but more produced the increased export power helped greatly to ‘green’ the foreign power emissions. Even if the neighbors didn’t green their power systems sooner or later it would be green thanks to increasing German exports and shrinking national demand. Fraunhofer ISE reports a RE share of gross power supply of 32.5% (page3) versus AGEB’s 30%. And Fraunhofer reports a RE share of 35% of public net power supply versus AGEB’s 33%. The highest discrepancies are the numbers for lignite and hard coal usage and as well for biomass usage (all in the electricity sector). With this in mind there might not have been a total CO2 emission increase in 2015 compared to 2014 despite the colder weather and more transport. Fraunhofer’s data seem to be more accurate I think. Well, I hope so! So Germany is now trying to *prevent* renewable energy? No, people will not tolerate that. Solar is already winning auctions in most countries. An artificial limit of 45% will not be considered acceptable. A big problem is of course that a large part of the stock of RWE, Eon an EnBW is owned by different levels of government in Germany. Therefore, there is a large financial incentive to favour these companies above decentralised citizens owned projects. The data show that Germany has replaced nuclear power production with renewable power production, while fossil fuel power production has stayed about the same. How does the replacement of one zero carbon power source with another zero carbon power source help the fight against climate change? What is the cost/MWhr differential between the nuclear power that was retired and the renewable power that took it’s place?